No matter what theatre is on their season schedule at Dramatic License, you can always count on two wonderful productions year after year- the Valentine Cabaret and the Holiday Cabaret. 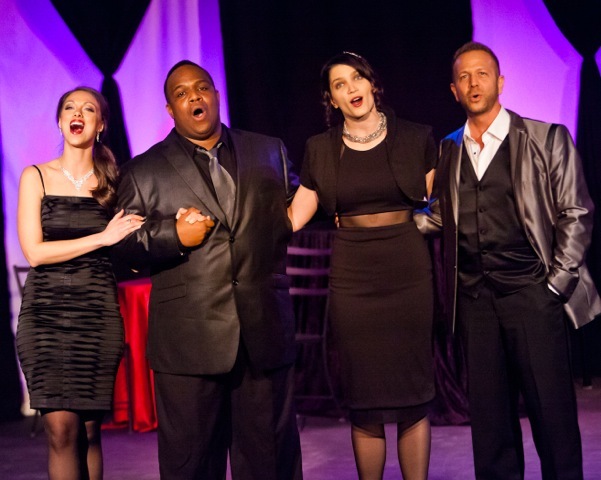 This year, “A Valentine Cabaret- Love Songs Of Broadway” offers four outstanding actor/singers and a wide range of great music from the Broadway stage. The delightful Sabra Sellers was evidently a last-minute replacement but she didn’t flinch a bit as she fit right in and got into the spirit of things in clever ensemble pieces like the first act finisher, “Let’s Not Talk About Anything But Love” and her touching solo turn with “A Quiet Thing” from “Flora The Red Menace.” She got raves last year for her star turn as Gypsy Rose Lee in “Gypsy” at Stray Dog Theatre and I’m still impressed with how well she can belt a tune. Through several set backs such as last minute replacements of a couple of artists and some other behind the scenes shenanigans, Dramatic License has provided another outstanding edition of their “Valentine Cabaret.” With Zachary Stefaniak’s wonderful direction and choreography and this talented group of performers, it’s a pleasant way to spend a couple of hours. By the way, the next Dramatic License theatre production is scheduled very soon- “Shirley Valentine” (sort of a sequel to the Valentine Cabaret, I guess), opens February 27th starring the very talented Teresa Doggett. Give them a call at 636-821-1746 for tickets to “Shirley Valentine” and to get information on the rest of their season. This entry was posted on February 18, 2014 at 9:43 pm02 and is filed under Uncategorized. You can follow any responses to this entry through the RSS 2.0 feed. You can leave a response, or trackback from your own site.